As we close out the year, we honor and celebrate the incredible work done by hundreds of volunteers. Their efforts reach many thousands of migrants, refugees, and undocumented community members. In the last year, volunteers put 19,444 gallons of water on migrant trails. Our humanitarian-aid efforts in the desert cover an area of 2,500 square miles. Our desert first-aid clinic was staffed nearly 365 days of the year, providing respite and medical assistance to those crossing through the borderlands. Photo: María Engracia Robles Robles. 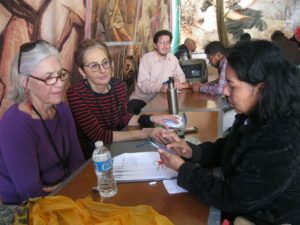 In Nogales, Mexico, we provided 2,150 phone calls to migrants and those recently deported. They called friends and family in 12 countries. Volunteers helped 469 people recover a total of $54,134 from the Arizona Department of Corrections after they were deported. We distributed more than 1,200 harm-reduction kits to migrants preparing to cross the desert. The kits contain lifesaving supplies for disinfecting water and preventing blisters. Through the Keep Tucson Together legal clinic, 6 people got their deportation cases closed and more than 300 completed the naturalization process to become US citizens. We welcomed and trained more than 200 new volunteers to help with our work. Of these, 111 traveled here from across the US and from abroad to assist with desert humanitarian aid. Our abuse-documentation team released our 5th report, written in collaboration with La Coalición de Derechos Humanos. 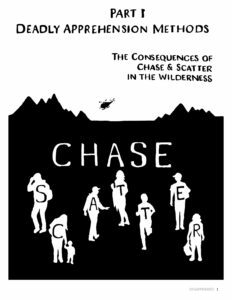 The first installment of Disappeared, out December 7, focuses on reckless Border Patrol apprehension methods and the deadly consequences of “chase and scatter” in the wilderness.